Sony A7Rii Hot Shoe issues. Brazilian fashion and commercial model Julyana Soares came to my studio with the brief from PRM Models London for some updated commercial pictures for her portfolio, with a raw, fashion edge/feel. I wanted to keep these images as natural looking as possible, but with a little bit of edge to them. Natural light with a diffuser helped soften/diffuse the harsh sunlight on the day, coming from camera right (models left). This allowed the light to be diffused yet still accentuate the models features and definition. I used the Sony A7Rii paired with the Sony Zeiss 55mm f1.8 , this gives ultra sharp images even at large apertures. Also allowing me to crop in for tighter pictures if need be. Shooting tethered to my MacBook using a Tether Tools USB cable. Using CaptureOne Pro 9 for Sony, I can easily review images as the shoot goes on. I organised a test shoot with Annabel Lewis from Lenis Models London. I was looking to update my portfolio with some raw looking images, with a fashion feel. I wanted to try and get images with a slightly less of a standard studio feel. I originally thought I would shoot these images to be black and white, but when processing the files in Photoshop I found colour version to work better. The background stood out a bit too much when processed in black and white, even using a wide aperture of f2.2 to try and blur the background more. I used the Godox system, of the Godox AD600 battery powered strobe as the main light (beauty dish) and 2 Godox V860 II-S, this allowed me to use High Speed Sync (HSS), a faster shutter speed and wider aperture. Using simple outfits and a combination of the lighting above I was very pleased with the outcome (shown below). The Sony A7Rii paired with the Sony 55mm f1.8. This gives ultra sharp images and gives me more flexibility to go from full length and closer up without getting any distortion. In the studio shooting tethered to my MacBook using a Tether Tools USB cable. Using CaptureOne Pro 9 for Sony, I can easily review images as the shoot goes on. Having recently signed Paige Amber to their agency PRM models requested me to shoot a test shoot with her. Looking for studio portraits; fashionable, current head and body shots. I wanted to try a simple lighting for a head/shoulders shot, thinking black and white would suit perfectly. Using only one light (Elinchrom BRX500) and a Westcott 45″ shoot-through umbrella directly pointed at Paige this gave a soft yet punchy light to the face. Being tethered to my MacBook using the TetherTools tether cable is a great help in the studio. After reviewing the pictures through CaptureOne 9 (for Sony) I didn’t think the shadows on the face were strong enough, so I added 2 black v-flats to, 1 each side of the model. This increased the contrast to the skin tones which I really liked. I deliberately underexposed the images by 0.5 stop. This produced a darker skin tone and made the glossy makeup of Paige’s stand out really well. Having recently purchased the DJI Spark fly more combo drone, I wanted to take it away to Cornwall to give it a good test run. Here is the results from my 2nd flight on St Eval beach. With all the great summer weather we have been having lately, I have been eager to shoot outside as much as possible. Harriet Finley Martin from Nemesis Models got in touch about doing a location test shoot. Harriet is a experienced model with already a great portfolio, but in need of some more outdoors/location images. I had the idea of shooting at a local beach (West Witterings, Chichester), this offers great sand dunes and calm water for potential locations. To try and give the pictures a little more edge and drama we decided to shoot right at sunset, using the great colours of the light at that time, but also not much time to shoot. (Approx 9.15pm sunset). Trying to keep my kit as simple as possible I used my Sony A7Rii camera with a Zeiss Batis 85mm f1.8 lens. A great combination for sharp, contrasty images, that really isolate the subject in the scene, also giving great colours. As the light at that time is very flattering I only needed simple lighting modifiers to give a little punch/pop to the pictures. Using the setting sun as the main/key source of light, I positioned the sun over the models left shoulder. x1 California Sunbounce reflector on the models right (camera left) to reflect the warm sunlight back into the shadow side. To help warm the light even more I used the gold side of the reflector. Edited/retouched in post using Adobe Photoshop CC 2017. Ever since purchasing my Sony a7Rii camera I have used it 75% of the time in a studio environment with studio lighting, with fantastic results, wonderfully sharp and detailed images (examples here). I use Elinchrom lighting in my studio and the Elinchrom Skyport triggering system to trigger the strobes. The Elinchrom Skyport trigger uses a standard hot shoe mount with a single pin connection, designed to universally work with most camera brand hotshoes. The Sony a7Rii uses the ‘Sony Multi Interface (MI)’ as a hot shoe connection. At first I wasn’t too sure that the Sony Multi Interface hot shoe mount would accept or work triggering my Elinchrom strobes with the Elinchrom Skyport trigger. To my delight it worked first time with no issues. Over time of using the pairing I’ve found quite often get misfires/none firing with the Elinchrom Skyport on the Sony A7Rii. Starting at around 1 in every 20 triggers, then progressing to around 1 in every 10 triggers. At first I thought it was an issue with low AA batteries in the Elinchrom Skyport trigger, so changed them to a fresh set. This didn’t remedy the problem. While shooting one day I accidentally knocked the Skyport trigger unit on my camera, when picking it up to shoot after a break (up to that point the trigger had been working fine with no mis/none fires). After the knock the trigger would not fire the stobes at all. I then realised that it must be a connection problem between the camera and the Skyport trigger causing the mis/none fires. 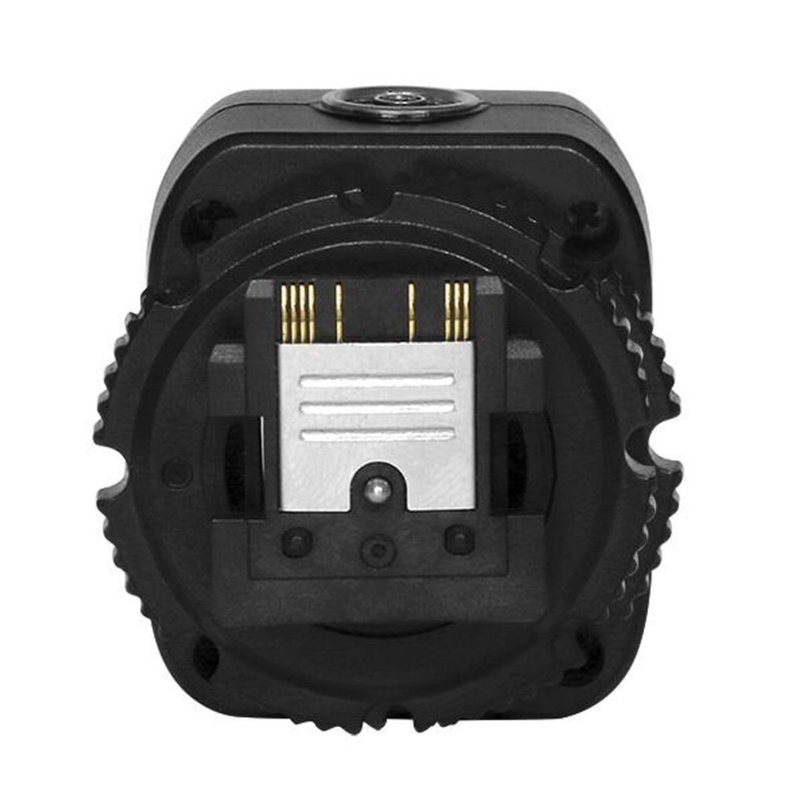 I noticed when sliding the Skyport trigger into the Sony Multi Interface hot shoe it slides quite far forward into the mount, resulting in the single connection pin in the centre of the hot shoe not properly lining up. Not wanting to have to accurately slide the trigger everytime, I looked for a solution. 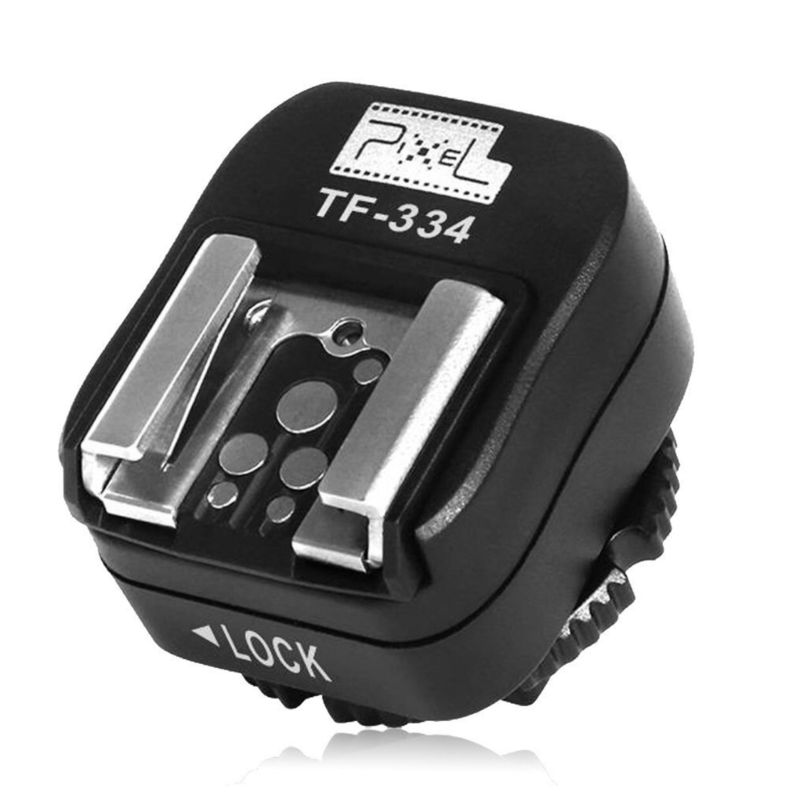 I found a hotshoe adaptor made my PixelKing (Pixel King TF-334) on Amazon.co.uk which adapts the Sony Multi Interface hot shoe into a standard hot shoe mount. At around £10 it was worth a try. After arriving I tested the hotshoe adaptor using the Elinchrom Skyport and Sony A7rII and it works flawlessly. I have now used the for my last 7-10 portrait photoshoots and not had any misfires or non firing stobes at all. It is very well built, small and lightweight and ensures a correct reliable connection between the Sony A7Rii and the Elinchrom Skyport. It only makes the trigger sit slightly higher from the camera body. I leave it permenttly attached to my Elinchrom Skyport in my camera bag. I hope this information helps any other Sony users. Another test shoot was arranged through PRM models, Brazilian model Tainá Duarte, briefed from PRM for some clean studio portraits; fashionable, current head and body shots came to my studio. On the day, having great weather we shoot some location images at the beach as well. Tainá is a very experienced model with already a really diverse portfolio. 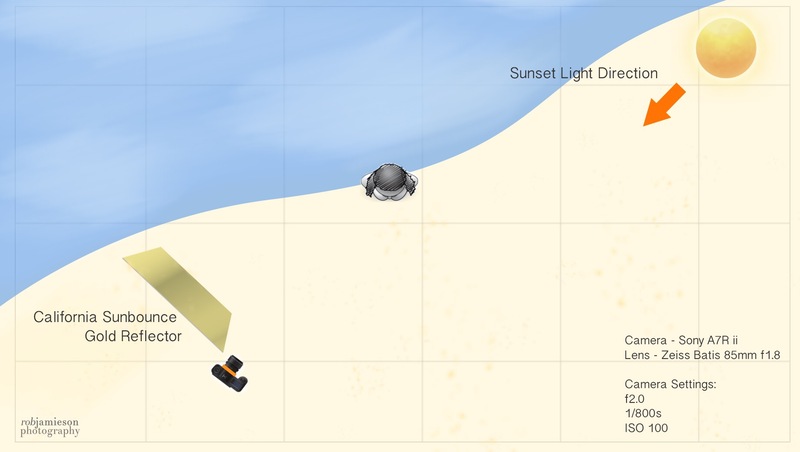 The lighting setup for the first look (shown in the diagram below) . The main light was a Elinchrom D-lite 4it fitted with a 44cm white Elinchrom beauty dish, pulled back from the model this gives a really nice contrasty look and harder shadows. This probably wouldn’t be something I would recommend to a model with poor skin as it does accentuate imperfections. The 2nd Elicnhrom D-lite 2 is positioned under the main light with a standard portalite soft box, this was used to fill in the shadows and lower the contrast of the overall image. The 3rd/4th lights were 2 Elinchrom D-lite 2‘s also with the standard Portalite softboxes attached. Pointed at the background on high power they were lighting the background just under 2 stops of light brighter than the main/key light. Using a white V-flat reflector on models left fills in the shadows on the face opposite to the main/key light, also allowing the model to be more free with posing without running the risk of losing facial features in shadow when turned a certain way. Shooting at the beach I used the Godox AD600 battery powered strobe with the built in HSS (High Speed Sync) mode. Along with a simple white reflector this helped even the light on the models face without overexposing the background. Using the sun as a natural backlight this gives a really pleasing halo around the model. The Sony A7Rii paired with the Zeiss Batis 85mm f1.8 is my go to camera setup for studio work. This gives ultra sharp images and also allows for easy cropping the image in post production. PRM models got in touch with me to do test shoots with some of the models they have on their books that need some new/fresh images in their current portfolios. Brazilian model Julyana Soares came to my studio with the brief from PRM for some simple studio portraits; fashionable, current head and body shots. Julyana has a very strong/alluring look, I wanted the lighting as simple as possible, but with plenty of shadows to give the images a captivating/eye-catching vibe. Using 3 Elinchrom D-lites (shown in the diagram below). The main light was a Elinchrom D-lite 4it fitted with a medium soft box, used as close as possible to the model, this is a great soft yet punchy light that I find really gives nice skin tone to models. The 2nd and 3rd lights were 2 Elinchrom D-lite 2 with a standard Portalite softboxes attached. Pointed at the background on low power they were to give the background a soft black/grey look instead on jet black (to avoid losing the model into the dark background). I used white v-flat reflector on camera right to lower the contrast in the shadows on the model. The Sony A7Rii paired with the Zeiss Batis 85mm f1.8 is my go to camera setup for studio work. This gives ultra sharp images and also allows for easy cropping the image in post. Coming from the Canon EOS system I was spoilt with the amount of Canon & 3rd party brand accessories available to work seamlessly with your Canon DSLR. The Sony E-mount being a newer system, accessories are still in the pipeline and/or not available.At this time for Sony mirrorless camera users waiting has been quite normal for many accessories, lenses and firmware updates. Professional portable portable flash options are one of the areas that the Sony system is lacking, potentially putting off some professional photographers from getting in to the system. In the studio I use Elinchrom D-lite 4 IT strobe lighting, this works really well with Elinchrom Skyport Trigger on the Sony A7Rii, but isn’t so great for location work due to the 240V mains adaptor needed to power each unit. So without a petrol generator or long extension lead these are not the lights for outdoor location lighting. Shooting fashion and portrait photography I quite often find myself shooting on location, in ‘not so ideal/flattering’ conditions. In the past with my Canon 5Dmk2 I used a combination of off-camera flash (Canon 580ExII), wirelessly triggered using Calumet Wireless Radio Triggers and/or reflectors. This wasn’t a perfect solution, the Canon speedlight not having really enough power for prolonged use of the in built High Speed Sync (HSS) and the AA battery power quite quickly used its batteries. The reflector requires an assistant to hold and quite often causes glare in the models eyes causing squinting. Nevertheless it worked for the amount of use I needed it for. Example of images taken using 5 in 1 light reflector in bright midday sunlight. When switching to Sony E-mount system I was looking for a more powerful flash unit that would also offer high speed sync and longer battery life. Sony offer speedlights similar power to the Canon 580ExII I was used to, but I wanted to steer away from portable speedlights into a more substantial strobe light and battery pack combo. Companies such as Elinchrom (Ranger Quadra), Profoto (B1) and other market leading companies all offer great ‘on-location’ portable solutions to lighting. Many of these make brand specific ‘smart’ radio triggers that work directly with your camera brand, allowing triggering and power adjustment directly from the top of the camera. Unfortunately none I found offered a Sony version of the triggering systems. Most only just for Canon and Nikon. Researching online I found a few ways around this using different combinations of 3rd party brand items, for example using; The Jimbei HD-600w strobe light unit, pairing this with Sony specific Pixel King radio triggers. This did seem like a viable option, but the Pixel King triggers were discontinued. I also would have been unable to control the light directly from on top of the camera. Doing quite a bit of online shopping for my photography gear on Amazon.co.uk I always spot the brand Godox making good affordable lighting products, but I haven’t ever owned any myself. I saw a review for the Godox AD600BM on youtube and was immediately blown away but the specs and price. Full Power Flashes: 500 approx. The Godox AD600BM is a 600W portable strobe unit with built in radio reciver for Sony, Canon or Nikon. This can all be remotely controlled from the top of the camera with the Godox X1T-S trigger (Sony). The strobe is also available with a TTL function. I purchased the non TTL version of the AD600, saving approx £150. Using it combined with my Sony A7Rii has been a brilliant seamless process, with no set up required. Everything in one unit.- This is possibly the best selling point for me, I really don’t want to be carrying around a whole separate bag just for lighting gear. The AD600 having the removable large lithium battery built in to the unit itself give it great portability. No need to additional battery packs dangling down from the flash head. Pair this with a Godox ‘pop-up’ umbrella soft box and you get a easy to use/set up portable 1 light setup which you can set up, move around and take down in minutes. 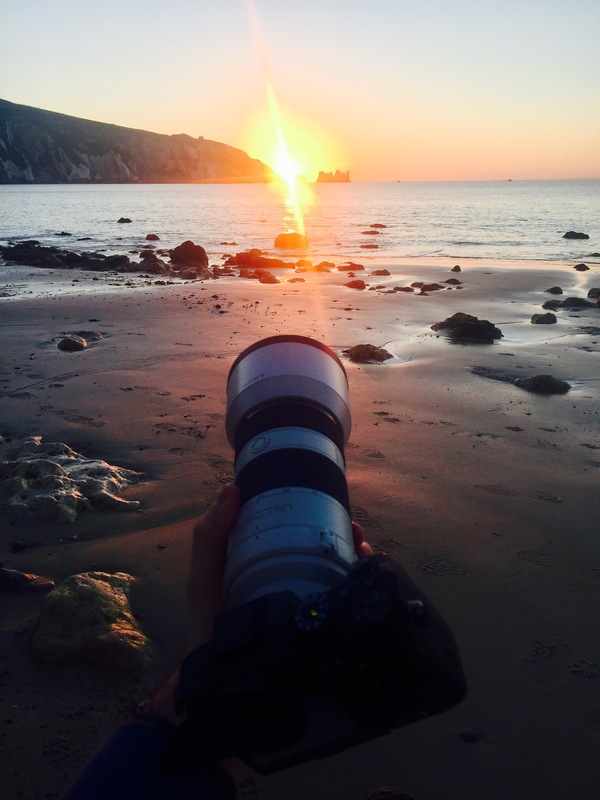 Battery Life – I quite regularly use this for 400-500 shots on a days shoot and I still have life left in the one charge. Having a battery indicator on the battery is also a nice feature to have to show when you are running low on power. Bowens accessory mount – This allows any Bowens style lighting modifiers to be attached to the front of the Godox AD600 without the need for adaptors. HSS (High Speed Sync) works great. Fantastic for portraits with depth, and out of focus backgrounds in bright sunny days. Spare Parts/Accessories – Components such as spare batteries, bulbs, triggers are all reasonably priced and easily sourced. A spare battery costs £135, a remote head extension costs £51 and a AC Power adapter costs £75. Powerful – Having a guide number of 87, you can shoot at higher powers for longer than smaller, lower powered speedlights. Also with much faster recycling times. Built in LED modelling light is a very nice addition to the unit. It isn’t the most powerful of LEDs but does help focusing if used in darker conditions. Easy to set up with reliable, well built trigger system. I’ve never had an issue with mis-fires or connection problems so far. Good Price, although all the competitor strobes are all slightly different, all essentially the same, the Godox Ad600BM is £380 on Amazon (on 18th Jan 2017). Profoto and Elinchrom are £1000+ for a similar setup. The unit is very heavy (well balanced though). Not a major issue and to be expected considering the large lithium battery is on the back of the unit. As long as you are aware of the weight, use sandbags and a heavy duty lighting C-stand its not too much of an issue. Only Godox or Bowens accessory mounts available. Again not a major issue as Bowens mounted accessories are easily available, more of a personal annoyance as I use Elinchrom lighting, all my softboxes/accessories are Elinchrom mount. To get round this I found a Bowens to Elinchrom adapter which allows my Elinchrom mount accessories to be mounted to the Bowens mount. 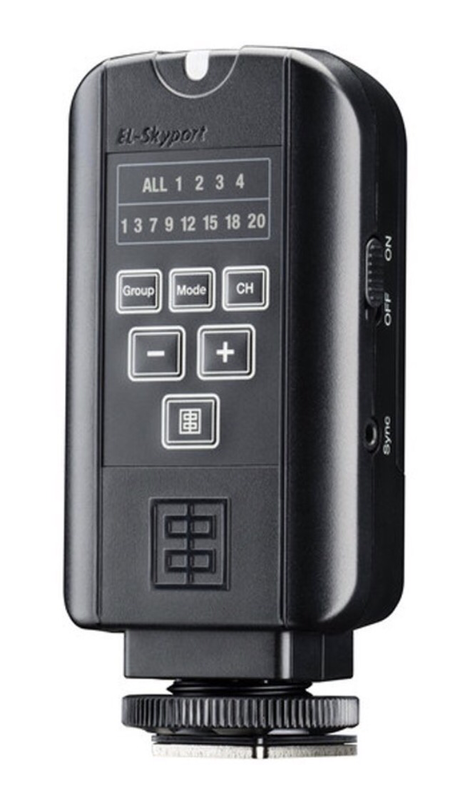 The remote trigger is quite large on top of the camera and also has to be purchased separately to the strobe. I would have been nice to have a smaller remote trigger that was included in the box. On top of my Sony A7Rii it takes over the top of the camera, slightly intruding over the mode dial. Again not a huge issue. In conclusion, if you are a Sony A7 user and on the market for a powerful, portable lighting solution, the Godox AD600BM for the money is the best way to go currently. Its all you need in one package, with the Pro’s significantly outweighting the Con’s. It’s a no-brainer. Even for non Sony users this would be a great solution to on location professional lighting. Using the Godox AD600BM for a 1 light beach fashion shoot setup. I have been using Canon equipment since I first started in photography 5/6 years ago. More specifically the Canon 5Dmk2 combined with the Canon 24-105mm f4, 70-200mm f4, 50mm f1.4 and 85mm f1.8. This setup I had been happy with for a long time, but as the 5dmk2 got older I was looking for a more modern camera with higher megapixels. When I first saw the Sony A7 series released on to the market I was skeptical that the tech sheets and hype over the new Sony system could actually be true in such a small package. I was very interested in purchasing one of the original A7R mk1 bodies, but was put of by the limited amount of ‘portrait’ lenses available, reviews on poor battery life and the electronic viewfinder not being as good as a optical viewfinder. As I saw more and more photographers using the Sony A7R mk2 and hearing/seeing very good results I decided to sell my Canon equipment and switch to the Sony e-mount. I purchased a Sony A7r mk2, Carl Zeiss 55mm f1.8, Carl Zeiss Batis 85mm f1.8 and Sony 70-200mm f4 lens. After a few weeks of getting used to the new system I can safely say that it was definitely the right decision. After now owning the Sony A7R mk2 for a year I have written a review/experiences from the perspective of a portrait/fashion photographer. Although not everyones cup of tea, I find the modern sleek design of the Sony A7R mk2 very attractive without being too ‘over the top’ or ‘in your face’. I like the small/light form factor of the body, most buttons and dials in the right places (some could be better placed). With a 42.3 megapixel full frame sensor the A7R mk2 produces fantastic, clean files with brilliant detail. The files from the A7R mk2 are double the size of my old Canon 5Dmk2, unfortunately this also does have a downside; when taking successive shots with the A7R mk2’s the buffer will take a while to store the images to the SD card. Purchasing the fastest SD cards you can will help nullify this issue (these are the ones I use). Unfortunately you can’t playback images while writing to the SD card also. Shooting portraits with the A7R mk2, when paired with a compatible lens (all native Sony/Carl Zeiss E-Mount lens to my knowledge) is made easier/faster by the face/eye tracking Auto-Focus system. This is a feature I find myself always using. It is fast and surprising very reliable/accurate. I don’t often use manual focus, but the manual focus aids such as focus peaking and zebra are nice features, they really help when I have had to manually focus from time to time. Colours and contrast from the Sony RAW files are good. Skin tones from RAW files straight from the camera I find require slight retouching to get them looking decent. My Canon 5Dmk2 files were much more true/vibrant straight from camera. 70% of the time shooting portraits and fashion images I find myself using the camera in “portrait” / “upright” orientation. This is when the small form factor of the camera body become a little bit fiddly. An easy fix for this was to purchase the VG-C2EM vertical battery grip. The grip makes the camera overall bigger and a little heavier (but still smaller/lighter than most pro DSLRs), it gives improved ergonomics for portrait shooting, improved body balance (especially with the 70-200mm lens) and doubled battery life. Battery Life, this was one of the original factors that made me initially hold off from getting in to the Sony alpha A7 system. Yes, the batteries don’t last very long at all, but the way I work, changing batteries from time to time isn’t a problem. The Sony A7R mk2 comes with 2 batteries in the box and cheaper 3rd party batteries are available from Amazon or eBay and are very good. I keep 4 batteries in total in my camera bag when on a portrait shoot. When shooting in my studio, using the battery grip (with 2 fully charged batteries) I can get a whole portrait session done with around 60% still remaining on the 2nd battery. This will typically be 500/750 pictures taken. The ISO performance of the A7R mk2 is great, much better than the canon 5D mk2. I can easily shoot useable portraits up to ISO 3200. I personally wouldn’t go past ISO 6400 for portraits; the skin, I found the noise and colour degradation are too far gone at the this point. Being based by the seaside, I shoot lots of portrait sessions on sunny, bright days on the beach. When before using my Canon 5dmk2 in bright sunlight this always meant I needed a loupe to be able to view the LCD display screen on the back of the camera. With the Sony A7R mk2 the electronic viewfinder (EVF) allows for reviewing images by looking through the viewfinder while in playback, this is a great way to review images accurately/carefully, even in the brightest sunlights. I did buy a 3rd party bigger/deeper eye cup, as I did find the original Sony eye cup leaked light in from the side. Another valuable feature when shooting handheld portraits is the 5-axis in-body image stabilisation. I have this turned on when ever possible. Shooting at shutter speeds as low as 1/30s with no worries of camera shake. One of my ‘go-to’ setups is the pairing of the Carl Zeiss Batis 85mm f1.8 the Sony A7R mk2 (pictured below), this is a fantastic portrait camera setup, capturing immense, sharp detail in and out of the studio. With this, I also quite often use the APS-c crop mode in the menu, this makes the 85mm lens the approximate equivalent of a 136mm lens. This does render the image a 18MP file instead of the 42.3 megapixel, but it a fast way of ‘zooming in’ and still keeping the ultra sharpness of the prime instead of an actually zoom lens. The Sony A7R mk2 certainly isn’t the perfect camera by all means, but in my opinion the pros massively out weight the cons. They’re are a few things that I would have liked to see in the camera; for example a better in-camera menu system, USB 3.0 instead of the USB 2.0 connection and maybe duel SD card slots instead of just the one, but all in all it’s a fantastic camera that can help produce stunning images.